5 Mins. 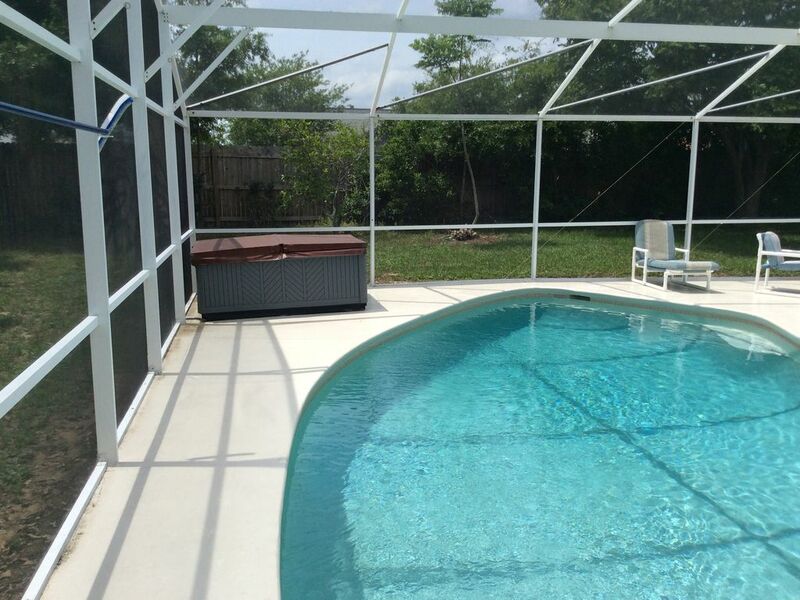 to Disney 3 BR/2BA Private Pool/Hot Tub/Pool Table/Fenced Yard. Pets OK.
House located at Indian Ridge. Perfect location for Disney vacation. Maximum occupancy is 6 persons. Fully fenced yard for pets. Very quiet and private pool Hot Tub and deck area. Pets welcome. Please enquire before reserving house. 2 pet maximum. There is a fourth bedroom which is used for the storage of owners personal items and this room is not accessible to guests. There is a Pool table in the garage together with washer and dryer. Garage also used to store personal household and maintenance items. The home is fully furnished throughout. All common areas are tiled. Two lounges. 55” Smart HD TV in main family room. Additional TVs in second lounge and in all 3 bedrooms. Smart TV's in all bedrooms. Ceiling fans in all common areas and all bedrooms. Disney is 3 miles. Celebration is 5 miles. Kissimmee is 12 miles. Pool heat is gas and is optional at $30 per night for number of nights’ house reserved, with minimum charge of $180. Absolute maximum occupancy 6 persons. Hot Tub heated free of charge. Cleaning charge of $125 per reservation and will be included in the quote you have received. Pets welcome $100 per pet per stay. Maximum 2 pets. Pool heat if required and pet fees if travelling with pets are both billed separately. House is located in very quiet area. Pool and deck are very private. Fully fenced yard for pets. Full central AC and heat. Full size Pool Table in garage. Mystic Dunes is one mile. Private swimming pool and Hot Tub. Pool heat additional cost. Hot Tub heated free of charge. Fully fenced yard. Very private. Pool heat additional cost. Private Hot Tub heated free of charge. Fully fenced yard. Very private. Full Air Conditioning, 5 Cable TV's - one in each of 2 lounges and in all bedrooms, Stereo and CD Player, Fully equipped kitchen, All linens & towels provided, private pool, jacuzzi, Hot Tub and Games room, No smoking in house, Smoking OK on covered pool deck, Ceiling fans throughout. Fully screened deck. Fully fenced yard. Never again! Very dirt! Disgusting place! Please do not rent his house! We really enjoyed our stay here. The property was exactly as advertised. Everything you would need is here. We enjoyed the pool and the hot tub. The pool table was fun. The house is beautiful and clean. Close to both Universal and Disney and restaurants and groceries are close by. The books and DVD's available are a nice bonus,The fenced in yard was perfect for our dog! I would recommend this property to anyone considering a stay in Orlando area. We had an excellent time! 1. AC system not working properly. We kept blinders down thru out the day to keep heat out. Garage doors down at all times for that reason. Still, to keep the house cool we had to leave fans on all night and day. 2. bed linen and towels not smelling fresh, clean nor comfy. 3. Not enough household supplies like dishwasher detergent, laundry detergent, trash bag, laundry detergent (for towels and bed linen). 4. Dirty pool floor. A person came to clean pool at our last days of staying. 5. TVs set and furniture outdated. Bad functioning of TV of the living room. 6. Dirty and old carpeting. 7. One night we struggle with the presence of a young bear at the front yard. I called 911. When the office approached with car the bear climbed a tree and there he stood. In the morning I called Simon and reported the incident. He said not been aware of bear in that neighborhood. The neighbors told otherwise, they have seen that bear around. Bottom line, I do not recommend this house to anybody. We loved the house/pool for the first couple of days. Then we realized the house had some pest issues that made it difficult to enjoy. I did contact the owner and he said he would take care of the problems after we left. I'm hoping he did. The house could be exactly what you are looking for with some updates and more attention to the property. House was very clean. Came with supplies in kitchen like some coffee & filters for drip machine (also had a Keurig). Pool was clean and water felt silky. Even had noodles for the pool. My only problem (and it was my problem) was the bed in the master was too high for me but ok for hubby (I’m only 4’11”) that we ended up in the guest room. Luckily it was also a king bed. I've had this issue at other homes but as long as i have another room to sleep in I’m good. House is so convenient to everything. Great fenced yard for our dog. This is the second time my husband and I rented this house. When I entered the house it looked very nice just like the pictures . Than we went to the store and I used the stove for the first time I found chunks of hamburger and spaghetti noodles on it. Grass was high when we got there so I called simon he was a bit rude at first. Then when the grass guy came he cut it and blew all of the grass in the pool and in the pool area I swept it up myself. I would not stay at this house again . Oh and beware of the hot tub its got enough chlorine in it to kill an elephant ! Pool heat optional. $30 per night for duration of reservation with minimum charge of $180. Hot Tub heated free of charge. Free Wi-Fi. Cleaning charge of $125 per reservation and will be included in the quote you have received. Pets considered. $100 per pet per stay. Maximum 2 pets. Pool heat if required and pet fees if travelling with pets are both billed separately.